You have ⚡0 SWIFT (unconfirmed: ⚡0 SWIFT). Your deposit address is SPJpCKhV9ru1Lkwhomx6KikF61Qu2XYzZn. Your deposit address is SUWd33sJmsRpnMEFP3yj2d8M9HRi3KnA8M. You have ⚡2.99 SWIFT (unconfirmed: ⚡39.989999999999995 SWIFT). Your deposit address is SXRZTWFvCiYw37Q2Bchzz15rpoeoqVJ8tp. Your deposit address is SPSEkyGh5sUMkUaHadEqHR9WfuYkWBGXsw. Your deposit address is SZVdJ2njpsJmnjLBoMuEpMbDDG4yTx5k5Y. Your deposit address is SNdZRjpCCSkwBZQGbQNC4iX8VgnCCMCbSu. @tammyp: ⚡100 SWIFT has been withdrawn from your account to SNdZRjpCCSkwBZQGbQNC4iX8VgnCCMCbSu. You have been charged ⚡0.01 SWIFT withdrawal fee. Transaction 42dec8ae8273c82a2deba7fc1dce4bcbd2b21fcdeec09be8426d4d33c9c97c13 is now completed. To monitor the transaction status click HERE. @rocksg: ⚡611 SWIFT has been withdrawn from your account to ScmMFpcpThML59AYgC5UkZNQSUPckurtBR. You have been charged ⚡0.01 SWIFT withdrawal fee. Transaction acab40890b0a5e39eb904cafbfb3c8bed4254db8b55f6546f709e89110a4247e is now completed. To monitor the transaction status click HERE. You have ⚡795 SWIFT (unconfirmed: ⚡0 SWIFT). You have ⚡10000 SWIFT (unconfirmed: ⚡0 SWIFT). Your deposit address is SMZcmaHMTCWjyTGKL6jp1Fh16YQtoDs58m. You have ⚡90 SWIFT (unconfirmed: ⚡0 SWIFT). Your deposit address is SSh6XHRt2AdKhZ6FRaAxGa4xwRybNuFZYb. 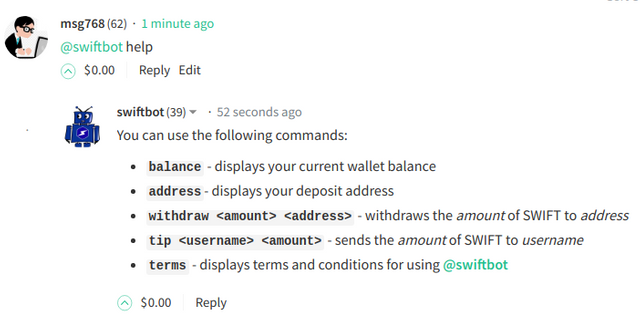 There are no fees to use @swiftbot, with the exception of 0.01 SWIFT fee on withdrawals. In no event shall @swiftbot be responsible in the event of lost, stolen or misdirected funds. Where can i trade, buy or sell #swift? Try Escodex. If you already have a bitshares account, like one with CryptoBridge or Openledger, etc you don't need to sign up again. You can use the same login. But if you just wanna sell the 100 tip you got, there is no point because it's not worth much. You can't even pay for BTC or ETH withdrawal fees with that. You have ⚡223 SWIFT (unconfirmed: ⚡0 SWIFT). Your deposit address is SeZLK3v4tMDXysP2ir72vTRbbmcBJVhdTa.